I remember feeling Matt and Kim's unbridled joy at doing what they love when I saw them play live for the first time, headlining Kohoutek 2009 (the annual music festival thrown by my alma mater's next door neighbor college). Other than their song "Daylight," which was making its way around CMC laptops, I knew almost nothing of the two before the show. After an energetic 50 minute set, which saw them run through their entire catalog with a short little "Final Countdown" cover and a crowd-surfing Kim mixed in, the crowd still hadn't gotten enough. 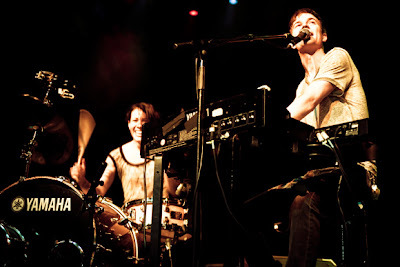 They wanted more of the feel-good music which had been making its way out of Kim's drum set and Matt's keyboard/synth. Didn't work. It wasn't because the duo didn't want to keep going. It was, and I remember laughing so hard when Matt told the crowd, that they didn't have anymore music to play! With the release of their new album, Sidewalks, Matt & Kim ensure that they'll keep the good vibes going for a little longer. The ten-track album feels like a natural progression to Grand. Their joy-of-life style still shines, but this time with a little added musical omph. The two have almost adopted a little hip-hop flavor to their style, and your favorite rapper's favorite rapper would probably love flowing on some of their beats. A standout track is this jamandahalf, "Good For Great." This has become the soundtrack to my 15 minute walk to the school I'm teaching English at, and always manages to make the increasingly cold mornings feel a little better. This song is all about living to the fullest, not being afraid to get a little roughed up, but more importantly, not being afraid to live.